Madonna was perfectly turned out and running nearly an hour late for an interview with the New York Times at her Upper East Side home on Wednesday evening. She looked tense as she apologized. “I’m late for everything now,” she said. She added that she has been in a rush since December, when a hacker put unfinished songs online from her new album, “Rebel Heart”. I intended to think about things, choose things more slowly — the whole process. Then I got forced into putting everything out, and now I’m trying to catch up with myself. What started out as an invigorating, life-enhancing, joyous experience evolved into something quite crazy. A strange artistic process, but a sign of the time. We’re all digital, we’re all vulnerable and everything’s instant — so instant. Instant success and instant failure. Instant discovery, instant destruction, instant construction. It’s as splendid and wonderful as it is devastating. Honestly, to me it’s the death of being an artist in many ways. I didn’t feel anything when it happened. I just remember falling backward, and I hit the back of my head. But I had so much adrenaline pumping, and I was so taken by surprise that I just was, O.K., I have to keep going. So I just got back onstage, and I just kept going. If I wasn’t in good shape, I wouldn’t have survived that fall. But I’m strong. I know how to fall — I ride horses. And I have core strength, and I know that saved me. That and my guardian angels. I believe that there’s the physical world and the metaphysical world, and I do believe that they are intertwined — as above, so below. So I think both were at work in the protection of me. One aspect was going to be a representation of the more rebellious, provocateur side of me. And the other side was going to be the more romantic, vulnerable side. I don’t like to dwell in the past, but it seemed like the right time to do so. After three decades one has to look back. Because there’s a lot of times I just stop and think, ‘Wow.’ I’m thinking about all the people that I’ve known, that I’ve worked with, that I’ve been friends with, that I’ve collaborated with, from Basquiat to Michael Jackson to Tupac Shakur. I survived and they didn’t. And it’s bittersweet for me to think about that. It just seemed like a time where I wanted to stop and look back. It’s kind of like survivor guilt. How did I make it and they didn’t? I’ve always admired the story of Joan of Arc and what she symbolizes, her conviction. I’m not quite there yet. Everyone does think of me as impenetrable and/or superhuman, and maybe that’s the way it goes if you’ve lasted for more than three decades. But of course that’s not the truth, and I guess I was trying to express that. In this business I’m in, you can start to feel like a gerbil on a wheel. People expect things from you. And I expect things from me. Since I was a teenager, I’ve never not been in some creative state, like in the act of making up dances, or writing songs, or whatever. I felt really drained. She decided to split her time between the “Impossible Lives” screenplay and songwriting. Her manager, Guy Oseary, suggested that she work with Avicii, the 25-year-old Swedish producer who has had worldwide hits with songs like “Wake Me Up,” and his songwriting team. Madonna has made her best albums collaborating primarily with one producer at a time — William Orbit on “Ray of Light,” Nile Rodgers on “Like a Virgin,” Patrick Leonard on “Like a Prayer.” But the Avicii connection led into the increasingly prevalent 21st-century pop methodology of multiple collaborators working and reworking songs for maximum sizzle: Kanye West; Diplo, who has worked with M.I.A. and Skrillex; Ariel Rechtshaid, who has worked with Usher, Haim and Vampire Weekend; DJ Dahi, who has worked with Drake and Kendrick Lamar, and more. I didn’t know exactly what I signed on for, so a simple process became a very complex process. Everyone I worked with is tremendously talented, there’s no question about it. It’s just that everybody I worked with has also agreed to work with 5,000 other people. I just had to get in where I could fit in. Toby Gad, a producer who has also written with Beyoncé, worked on 14 songs with Madonna; seven, including “Joan of Arc” and “Living for Love,” reached the album. The first week she was quite intimidating. It was like a test phase. You have to criticize, but you can’t really offend. But she also likes honest, harsh critics to say things as they are. It worked out really well and she got sweeter and sweeter. 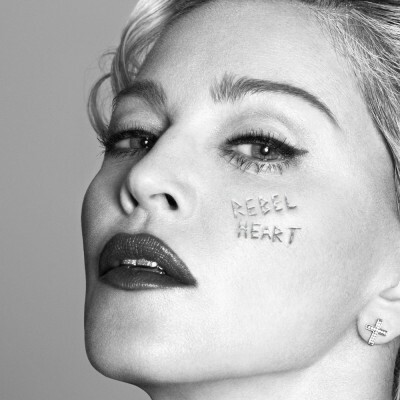 “Rebel Heart” may well be Madonna’s most diverse album. Songs also mutate as they go, style-hopping between verse and chorus. Mr. West’s productions mingle his sparse, abrasive rhythm tracks with catchy choruses. “That’s me,” Madonna said, smiling. “That’s where I come in. It’s an interesting marriage of both of our aesthetics.” She and Mr. West have also written a song for his next album, she said. Because I’ve been marginalized as a female in a male-dominated world, and we’re in a sexist industry or a sexist world, I’ve always had to push against something or resist against something. I don’t think I’ve ever been relaxed, if you know what I’m saying. So because I’ve never been relaxed, I’m not going, oh, it used to be so easy. For me, it’s always been hard from Day 1.